The most usual materials used for cameos are: shells (cassis madascariensis, cassis rufa, strombus giga) lava, coral , ivory and turquoise. 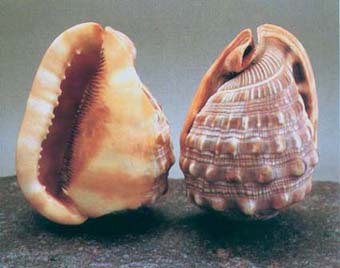 Strombus Gigas: ca 11 inches. Its white and pink layers are not always perfectly distinct from each other; also used for necklaces and buttons, fished in the Bahamas. Cypraea Tigris: ca 2-4 inches. Has seven different layers of colour. In order: tiger brown on the surface. Then white-yellonwish, grey-blue, two tones of purple and finally a slightly blueish white. Fished in Indo-Pacific.